26.11. ما دوباره در شهر دوسلدورف به خیابانخواهیم امد و " ما انسان هستیم و ما حق زندگی کردن داریم". اروپا در نظر دارد تا 80هزار پناهنجو ازافغانستان را به منطقه جنگی بازگرداند و تنها 40 هزار نفر از آلمان هستند. ما و تمام کسانیکه در جنگ گشته داده اند و داغدیده اند می دانند ، که افغانستان یک کشور امن نیست . جنگ در منطقه ادامه دارد وهیچ ساختار امنیتی در منظقه وجود ندارد تا یک غیر نظامی بتواند در انجا زندگی کند .طالبان و منبع نظامی حاکم در منطقه هیچ امنیتی را به ما ارائه نمی کنند. لطفا ما را در این تظاهرات همراهی کنید و با مابه خیابانها بیایید! demo in Düsseldorf: The residence restriction is against the human rights! CALL TO DEMONSTRATION: WE WANT TO STAY HERE! The residence restriction is against the human rights! Read more about demo in Düsseldorf: The residence restriction is against the human rights! Er wurde gezwungen im Kosovo Krieg in der serbischen Armee gegen Albaner zu kämpfen. Daher musste er nach dem Krieg nach Serbien fliehen. Sein Leben war im Kosovo in Gefahr. As Afrique-Europe-Interact we want to ask you for the support of a bus demonstration, which will take place on the 11th of November in front of several African embassies and the GIZ. The background is the Valetta process, which is becoming more and more violent and with which the EU does not only want to close the flight and migration routes in African countries, but also massively push deportations from Europe. Read more about Stoppez „la Valette“! We are a people, a people of the world. We are humans and we are free. That is the least of what is stated in the universal declaration of human rights. We are all equal. However some amongst us have fled war, violence, conflict and exploitation. 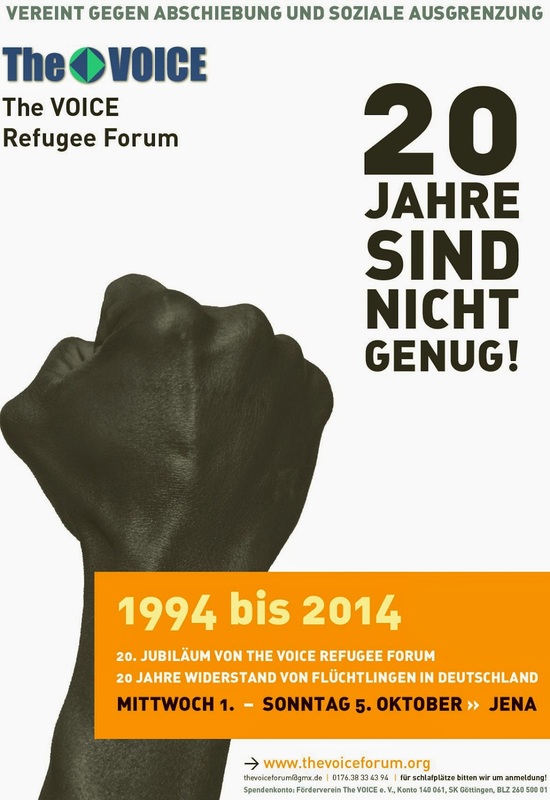 Schließen wir uns zusammen- Der FLÜCHTLING ist die Bewegung und unsere Gemeinschaft ist unsere Verteidigung in Europa von Osaren Igbinoba von The VOICE Refugee Forum. by Osaren Igbinoba of The VOICE Refugee Forum.